At some point, you’ve probably run across a statistic that goes something like this: “The average life expectancy for people in Victorian times was only 30 or 40 years!” This immediately conjures up images of young people rushing to marry and have children before their remarkably early “twilight years” settled upon them. But in reality, if you walk around Laurel Hill or any other Victorian Cemetery, you’ll find plenty of examples of people who died in their 70s, 80s, and even 90s, despite having lived through the seemingly deadly Victorian era. Were these long-lived people insanely lucky? Did they have the eating and exercise regimens of Olympians? Private physicians on call at all times? Probably not. The real reason the average life expectancy skewed so low is because the Victorian era was especially hazardous to the young. Surviving one’s first year of life was a considerable achievement. Beginning with childbirth itself, infants were exposed to many dangers which in some cases proved fatal. According to available statistics in certain areas, children had a 1 in 3 chance of dying before their fifth birthday. Children who did make it to age 5 however, were far more likely to survive well into adulthood. So you can see why the raw numbers seem to falsely suggest that adults routinely keeled over in their late 20s of “old age.” When fully 1/3 of a population is likely to die before they lose their first tooth, that harsh reality sandbags the overall average. But infant and child mortality was a very real issue for Victorians. Indeed, Laurel Hill Cemetery exists mainly due to founder John Jay Smith’s loss of a young daughter. So what was happening during the 19th century which made life so dangerous and short for children? Let’s take a look at a few of the main culprits. If you’re a regular reader of this blog, you’ve already heard about the state of many Victorian cities. Overcrowding was a real problem, and when large groups of people all live in close proximity, there are some immediate problems which spring up. Human waste would often run straight into waterways, and that’s to say nothing of the horse manure in the streets. Cities were, shall we say, “aromatic” in the summer. Then there are the issues caused by dead bodies. Churchyards became overcrowded and unsafe, and dogs or horses that died in cities would sometimes have to be left in the streets to decompose. This level of filth in the environment left everyone vulnerable to diseases carried through the water, through the air, and through insects attracted to the area. A photo of the street sanitation crisis in New York showing young children playing near the body of a horse. It takes a while for an infant to develop a robust immune system, and sometimes, sad as it was, the lack of sanitation would simply overwhelm them before their bodies had a chance to catch up. Victorians lacked the advantages afforded by modern medicine. Many of the people born in Victorian times had the bad luck to arrive before several hugely important medical discoveries: Lister’s Germ Theory (1870), Penicillin (1928), and the Polio vaccine (1953). Something as simple as a doctor or midwife failing to wash their hands before assisting in childbirth could kill both the child and the mother. The major disease contenders of the time were epidemics like smallpox, tuberculosis, scarlet fever, typhoid, and whooping cough. These diseases could hit large groups of people at once, and children were among the most vulnerable of the population. Once epidemics began, children’s lives were immediately at risk. The Victorian era overlapped with the era of what were known as patent medicines – a misleading term, because they actually did not require an official patent to formulate or sell. If you’ve ever heard the term “snake oil,” that comes from an actual parent medicine claiming to be made from the oil of real snakes, and intended as a balm to cure inflammation. The problem with these medicines was that they were held up as cures for all sorts of legitimate ailments, but were often full of dangerous, and in some cases, outright poisonous ingredients. Take Swaim’s Panacea for example. 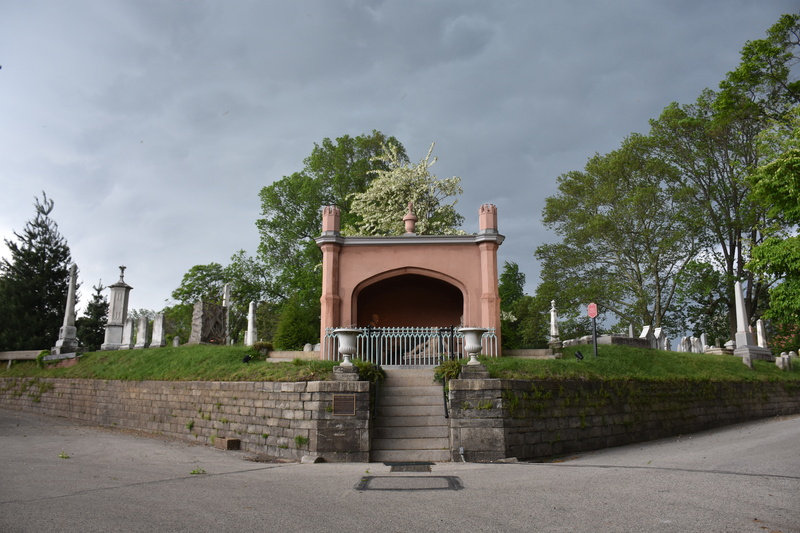 William Swaim is buried in the Medallion Garden at Laurel Hill beneath a distinctive Egyptian-themed tomb. He was famous for concocting his Panacea patent medicine which contained wintergreen, sarsaparilla, and… mercury. You can see how that last part was problematic. Other dangerous ingredients like opium, alcohol, cocaine, chloroform, tobacco, heroin, and lead were often mixed with ingredients that tasted good, and handed out to parents to help cure everything from minor complaints like teething to serious issues like typhoid. Not only did these medicines fail to address the diseases they were supposedly treating, but they often contained ingredients which could themselves seriously harm or kill children. Public schooling wasn’t always available to American children, and in Victorian times, kids often had to spend their formative years at work to help bring in money for the family. The types of jobs available to children were those which could benefit from the child’s small size. So kids were put to work as chimney sweeps or perhaps given jobs which required them to crawl under machinery. Needless to say, these jobs were dangerous enough, but then add in the fact that there was little to no regulation or oversight when it came to child labor, and you’ve got a terrible situation. Kids worked long hours with few if any breaks. Their pay was a pittance, and so when they inevitably got sick, exhausted, or hurt on the job, they probably couldn’t afford much medical care. The Victorian era is known for its fine clothing, beautiful architecture, and exquisite jewelry, but those things were only available to families with the means to afford them. Just like today, there were families living in poverty, but without public assistance programs, many suffered terribly. Children who were born to poor families didn’t stand nearly as much of a chance as those born into wealth. Children born in Victorian times had a rough road ahead of them, and indeed, a great many of them did depart this world while they were still young. This weekend at Laurel Hill, our tour “Forever Young: Gone Before Their Time,” will explore the realities of 19th century childhood, and visit the final resting places of some of those who fell victim to circumstance. This weekend’s tour just one of the 100+ events we offer every year. To stay on top of our event calendar, be sure to sign up for our newsletter.